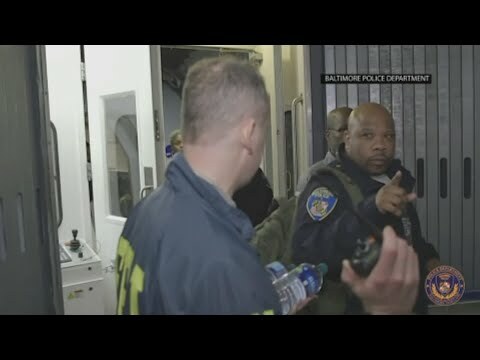 BALTIMORE (AP) — A man who garnered sympathy and widespread media attention after maintaining that his wife was fatally stabbed in their car after giving cash to a panhandler returned to Baltimore, along with his daughter, early Thursday to face murder charges. Baltimore police said 52-year-old Keith Smith and his 28-year-old daughter Valeria Smith, both of Baltimore, arrived from Texas shortly after midnight and were booked on first-degree murder charges. Both were denied bail at hearings on Thursday. The two suspects are charged in the death of 54-year-old Jacquelyn Smith, an electrical engineer who was married to Keith Smith since 2014. She was fatally stabbed late last year and Keith Smith’s tale of charity-gone-wrong generated headlines as people discussed the case on street corners, in offices, and on social networking sites. Keith Smith maintained his wife was knifed to death by a man after handing $10 to a female panhandler who appeared to be holding a baby late at night in a gritty section of Baltimore. But police say he concocted that story and went on the run as authorities were closing in. Smith and his daughter were arrested March 5 in Texas during what police portray as a desperate dash for Mexico. Brandon Mead, Valeria Smith’s defense attorney, said his client is innocent. He asserts father and daughter simply intended to take a family vacation south of the border when they were arrested after stopping at a gas station in a Texas border town. “Let’s be realistic: We would all love to take a vacation to Mexico. You know, you get a chance to go to Mexico you say yes,” Mead told WJZ-TV. Keith Smith’s lawyer, Natalie Finegar, told reporters she believes the evidence cited in the Baltimore Police Department’s statement of probable cause is problematic. “We haven’t seen any of this evidence yet and there are a lot of questionable forensics that are included in the statement of probable cause,” she asserted after her client was ordered held without bail. Among other things, charging documents in the case state that a friend told detectives Keith Smith had asked his brother “to get rid of Jacquelyn,” taking that to mean he wanted to kill her. Police believe Jacquelyn Smith was about to divorce her husband, who was convicted 20 years ago for robbing the same Maryland bank three times. When Vick Smith was subpoenaed to testify before a grand jury, police wrote that he alerted his brother, who began seeking a way out of the country. Police also say Keith Smith immediately relocated to Florida after an interview with detectives where he was told his daughter’s phone showed they had actually driven into a wooded park on the night of the slaying. His daughter was believed to be living with him in Florida before the pair was arrested earlier this month in a Texas border town. After his wife’s death, Keith Smith gave several media interviews, sometimes with a tearful Valeria by his side. He lobbied the city to pass legislation to ban panhandling at city intersections, saying he wanted the law to be named for his dead wife. Authorities accuse the two suspects of exploiting fears about Baltimore’s chronically high rates of violence in an attempt to evade justice.